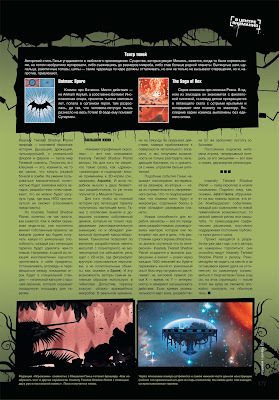 Last summer, we were contacted by the editor of a Russian gaming magazine called Igromania. They wanted to do a feature on our game and sent us a bunch of questions. We went back and forth with emails and phone calls and later, we were sent a PDF of the two-page spread layout. Looks like the issue came out last September. We'd love to get a physical copy of it if anyone has a spare. Ah, sorry, it's written on the side of your PDF - Sept 2009. Thanks a bunch Anton, I'll update my post. 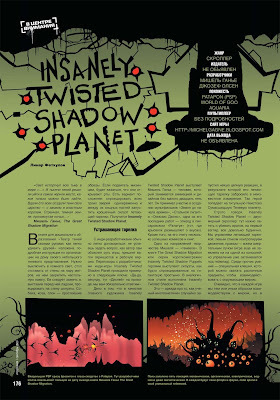 Just posting to say that I'm really looking forward to Insanely Twisted Shadow Planet. It looks like an amazing game and the artwork is fantastic. I am really looking forward to your project, it looks very well made and interesting! Getting the game THE EXACT SECOND it comes out. SO looking forward for this game. Looks extra cool.